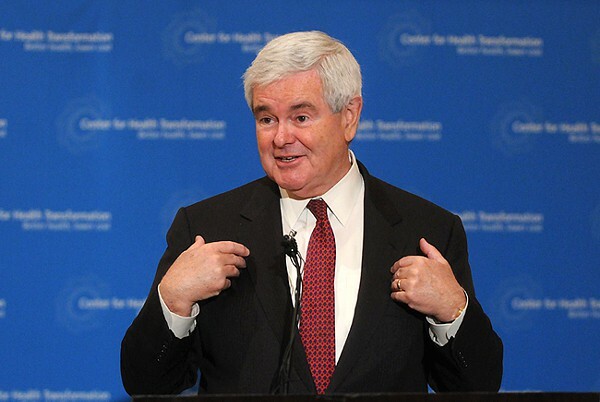 Newt Gingrich is obsessed with the plight of poor kids these days. He's been all over the place talking about them, and I have to confess, the jollier he gets about his remedies for their plight, the more nervous I become. It's an odd turn of events and one rife with suspicion. It's Newt we're talking about. Newt, who eats mean for breakfast and swallows the seeds. Newt, who sings "Only I can make this world seem right. Only I can make the darkness bright. Only I and I alone can thrill me like I do and fill my heart with love for only me." And encores with the stirring, "For what is a man, what has he got? If not himself, then he has naught. To say the things he truly feels and not the words of one who kneels. The record shows I took the blows and did it my way!" Ordinarily I wouldn't care about Newt's $60,000 per speech blabbings about stupid child labor laws and how really poor kids from really shiftless families will resort to stealing unless he steps in and puts them to work, but after some lengthy and intense investigation, I find I have barely an ounce of faith in this current century's sanity. That dimpled nasty man could very well be running things come January, 2013. There are some who defend him by reminding us that there's nothing wrong with kids doing a little work. The kids feel good about themselves and the upside is that, as Newt says, they can buy their own ice cream someday. Nice, really, that. In a sane world we might actually picture our sweet darlings helping out and getting paid a tiny reward, leaving everybody happy, happy, happy. “Start with the following two facts. Really poor children in really poor neighborhoods have no habits of working and have nobody around them who works, so they literally have no habit of showing up on Monday. They have no habit of staying all day. They have no habit of ‘I do this and you give me cash’ unless it’s illegal. That's not helpful, that's hateful. And full of hidden meaning. What does it mean when Newt says, "You have kids who are required under law to go to school"? 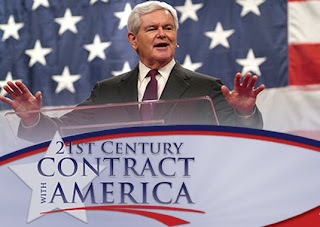 Will there be an addendum to Newt's 2ist Century Contract on America abolishing school attendance for "really poor kids" so they'll have more time to do all that rewarding work? When the kids take over as assistant clerks and assistant librarians and assistant janitors, what does that do to the work hours of the real clerks, librarians and janitors? I'm reading between the lines and seeing part time jobs with no bennies for everyone as part of Newt's grand plan. He's Newt, after all, clearly not Mr. Empathy. If you've followed Newt at all you know how strongly opposed he is to equality of the masses -- the kind of thing any signs of empathetic weakness might very well lead to. Lots of kids work after school and weekends now, even amongst the "really poor". It's what kids do when they get old enough. They baby-sit, they do paper routes, they cut lawns, they wash cars, they run errands. What they don't do any longer is work in sweatshops under conditions that could maim or kill or rot the spirit. From Utata Tribal Photography: Lewis Hines, photographer, 1906 "Hines kept detailed notes on the children he photographed, including comments they made as he interviewed them. The twelve year old boy in the [above] photograph was unable to read or write. 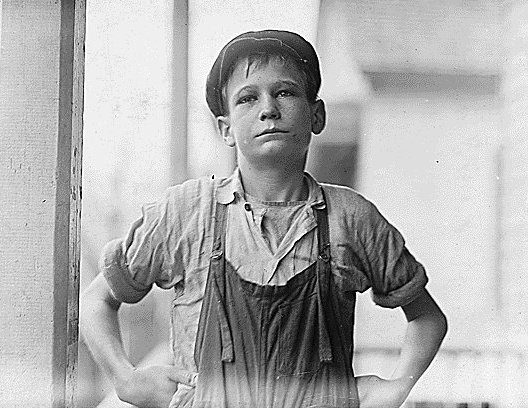 He'd been employed by a textile mill in Columbia, South Carolina for four years, since the age of eight. He told Hines, 'Yes, I want to learn, but can't when I work all the time'." Any student of history will tell you the reason we aren't allowed to work kids like that any more is because the laboring masses organized and put a stop to the exploitation of children by the privileged few. Newt the Historian seems to have forgotten that. And, okay, I have to ask: How many communists were there in congress? Were they as hard on us as the teabaggers in congress today? Can you give us a few tips on how to get rid of subversives? Yes,I agree. He's really nasty and in comparison to the other idiots on the ticket, he might seem a reasonable alternative to Romney, who no one seems to want to win the nomination. But both of them have no love for the middle class. Both of them are "entitled" in their lifestyle and expectations for future lifestyles. Both are a bit too ambitious for my tastes. Both are Republicans. And that's bad. We have to work as hard as we can to make sure that none of the nasties occupies the White House. Hi Stan, nice to see you here! Politicians like Gingrich are scary because he has the ability to sound reasonable when he's spouting the most outrageous attacks on the poor and middle class. We're in a crazy place these days, and the proof is in the fact that the Republicans are making headway by blatantly showing their cruel side. Moderates are shunned just on the basis of their supposed fairness. Yet Obama doesn't seem to feel the need to get as far away from them as he possibly can. The OWS movement should be showing him who is base really is and what they want, but he's dragging his feet again and I'm afraid he won't get with it until it's too late. Can you imagine Newt Gingrich as president? We ain't seen nothin' yet. This is really scary/spooky. I was in the middle of reading your post, and the phone rang, and IT WAS NEWT, trying to tell me what was wrong with this country and how he's going to fix it. I was very much spooked. Apparently he KNOWS WHAT WE ARE THINKING AND DOING and he's going to save us from ourselves and the error of our ways. SeDress, Now I'm really scared! Newt has that evil, otherworldly look sometimes and I wouldn't put it past him that he has, indeed, sold his soul to the devil and now he has powers that will finally do us in. The fact that he's number one in the Republican polls after what this country knows about him shows me there's something sinister afoot. We have to squash him like a bug while there's still time. We just have to. You can't spell "Grinch" without Gingrich. I agree completely with you. It just astonishes me that this guy is the front-runner. Are we in Bizarro World? I read a piece in the Times that called him a "bloviating garbanzo bean." :D My absolute favorite so far! JurassicPork, If ever there was a Grinch, Gingrich epitomizes him. "You're a mean one" just rolls off his back. I was glad to see that I wasn't the only one who noticed Newt's goofy phrasing about the communists in congress. So, yes, we know about Gingrich's failings and his posturing. Will it make a difference? Probably not with the Republicans. Looks like Newt is going to be their man. information and this can be useful some or maybe the other way. Keep updating your blog, anticipating to get more detailed contents.